Please click below for the SKGB associations accreditation form. Please click below icon to open or save the SKGB Four Year Business and Performace Plan. Please note that this seminar replaces the previously advertised Kata course on the 3rd of February, which is now cancelled. The course will be presented by Terry Pottage 7th Dan and “World Karate Federation” Qualified Karate Official. Attendance at this course is Free. Karate Gi will be required. The Holiday Inn Edinburgh is situated west of Edinburgh city centre. bars and free parking, regardless if they choose to book a hotel room or not. The seminar is open to all Karate officials who hold a current license with an association accredited to the SKGB. The hotel offers excellent accommodation that can be booked by officials online. Alternatively accommodation can be booked through the events manager, which offers cancellation security for £90.00 per room bed and breakfast. The cost of accommodation will be left with officials who attend however they are reminded that their associations may wish to contribute to the cost. The initial response to this course has already proved positive and persons who intend taking part are asked to confirm their attendance with Mark McCool SKGB Refereeing Commission Secretary as soon as possible. Details of championships will be posted in this section soon. 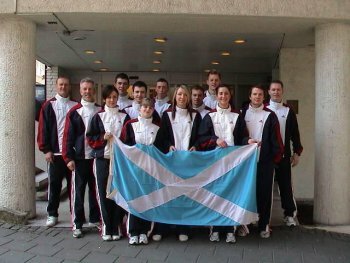 The next championships are scheduled for 26th Nov 2006 - SKGB Kumite Championships. Details of venue and squad training dates will be posted in this section soon. Please click below to read the Annual Report 2004 / 2005.